The list of materials to keep in the preschool art area directly underscores the learning artistic activities offered to young children. 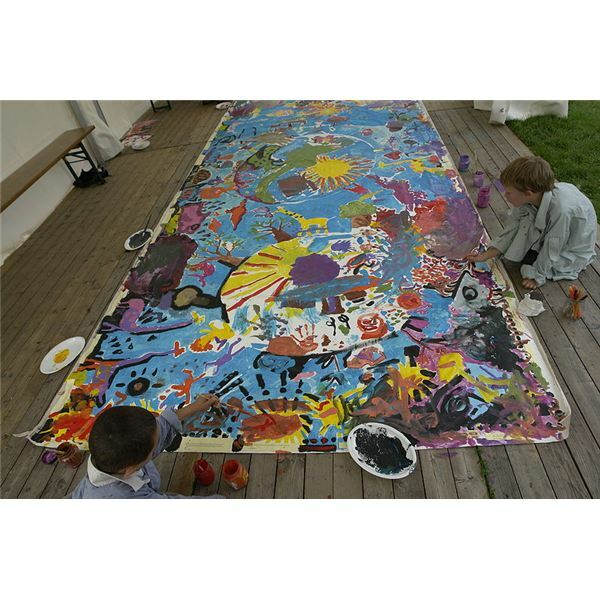 Preschool art activities foster creativity while concurrently allowing instruction in color identification, shape recognition, development support of hand-eye coordination, and small muscle skills. On an interpersonal level, preschool art projects offer practical applications for the concepts of sharing and the artistic expression of strong emotions. When combined with curriculum activities, preschool arts and crafts strongly support classroom instruction. Not surprisingly, the list of materials to keep on hand deserves careful consideration. Since these items get used up rather quickly – and some of them break during intended use or while not being handled properly – keep ample replacements on hand at all times. A good example is the crayon, which wears down during regular use and breaks rather easily. As a budget-friendly suggestion, buy in bulk whenever possible. Purchase classroom glue by the gallon and then separate it into smaller containers for student use. Pre-writing: Invest in large letter stencils the children may trace with crayons or markers. Colors: Save empty yogurt containers or egg cartons to use as mixing bowls for colors. Homemade play dough in the target color is another excellent idea for early sculpting. Numbers: Stencils of numbers are useful for tracing. Oceans or Lakes: Purchase green crepe paper rolls to mimic algae and other underwater plants. Cut up brown sponges to act as rocks in student paintings. Sorting and Matching: Themes involving these topics open up a wide array of options. Rely on precut shapes to provide materials for collages. Recycling: As outlined in the article “How to Go Green in the Preschool Classroom," reusing paper and plastic represents an excellent choice of materials. Keep an eye on upcoming calendar holidays as well. Special celebrations, national holidays, and state-specific remembrances or local events all lend themselves to stocking the art area with additional materials. For instance, Pueblo, Colorado hosts annual Wild West celebrations, which open up art activities related to frontier living, horses, and bulls. California-themed beach parades create a need for builders’ sand and larger seashells that may be used in arts and crafts. Any list of materials to keep in preschool art area closets must be governed by safety concerns and also a common sense approach. Remember that preschoolers vary in maturity level; some classes may not be ready for the supplies their predecessors handled without incident. Use only non-toxic paints and glues. If at all possible, opt for organically derived materials or homemade versions that allow the teacher to control the ingredients list. Consistently check the art supplies and remove any broken bits and pieces that present choking hazards. Maintain safe storage options for any art supplies that are not part of the activity. VMBM(1) suggests wall storage since this increases available floor space within the preschool classroom. Label containers with surplus art supplies to make restocking quicker and simpler. This list of materials to keep in preschool art area should keep your class having fun and learning while making their art projects.